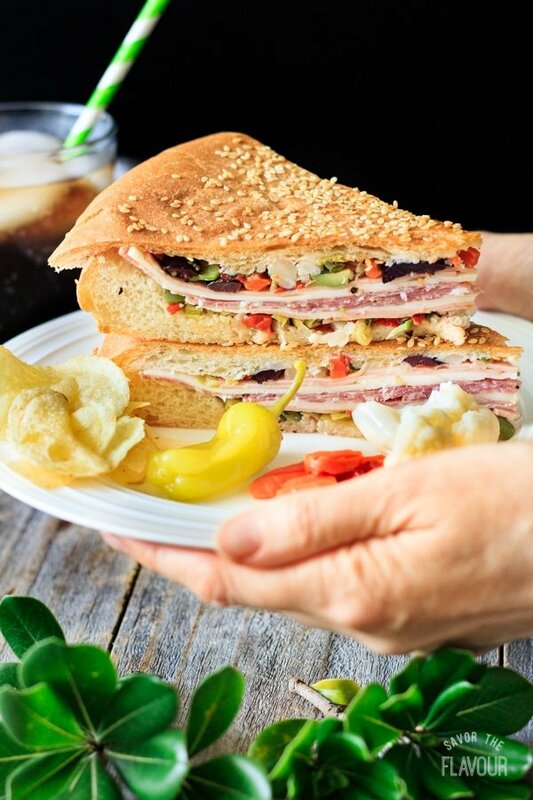 Muffaletta is an iconic sandwich from Central Grocery in the French Quarter of New Orleans. 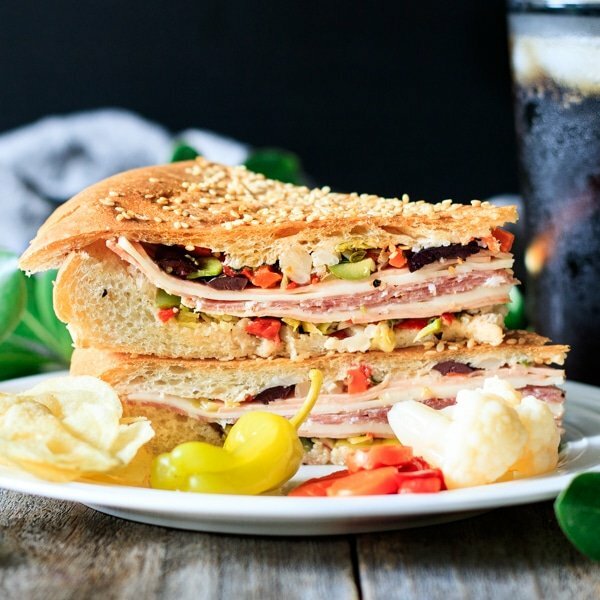 Fresh bread, olive salad, deli meat, and cheese are layered in this showstopping sandwich. It's an unforgettable addition to your Mardi Gras or Super Bowl menu! Are you tired of having the same kind of sandwiches for lunch? Break the boredom and try a muffaletta. What is a muffaletta sandwich? 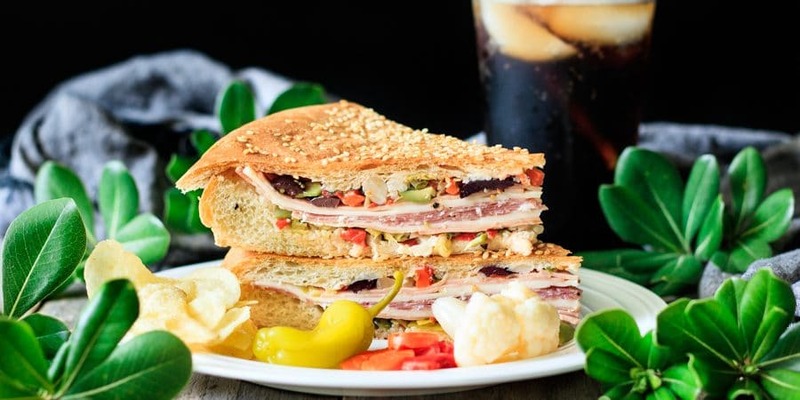 For over a century, this Italian sandwich has been famous in New Orleans. Rumor has it that the owner of Central Grocery invented it in 1906. Salvatore Lupo would watch fellow Silicians eat their lunches of Italian pickled vegetables, meats, cheese, olive salad, and bread. He decided it would be easier and quicker to eat lunch if all those ingredients were layered into a hearty sandwich. He also compressed the sandwich by weighing it down to improve the flavors and to make it easier to eat. His sandwich was an instant success with the local Silicians and now with the tourists. Can you make a muffaletta the night before? Yes, you certainly can. Muffaletta actually tastes even better when it can sit overnight! It’s best to eat between 2 to 24 hours after it has been assembled. It also travels well in a cooler, so it’s great for picnics or tailgating. How do you make a muffaletta sandwich? Cut a 10 inch round loaf in half horizontally, then hollow out the top and bottom halves. (Reserve the bread pieces for croutons, bread crumbs, or just a snack.) Brush the hollowed out halves with olive oil and any extra oil from the olive salad. Here comes the fun part: fill in each half of the loaf with olive salad, mortadella, provalone, and sopressata. If you want more meat and cheese, add an extra layer. Carefully flip the top half onto the bottom half to make the sandwich. Wrap it tightly with plastic wrap so it doesn’t dry out. I used a cake lifter to help, as this sandwich is huge and heavy! Place it in the fridge to keep it cool, and weigh it down with a heavy cast iron skillet or pot to help compress the layers. After a couple of hours or overnight, unwrap the muffaletta and slice into wedges. Wow! Isn’t it a gorgeous looking sandwich? 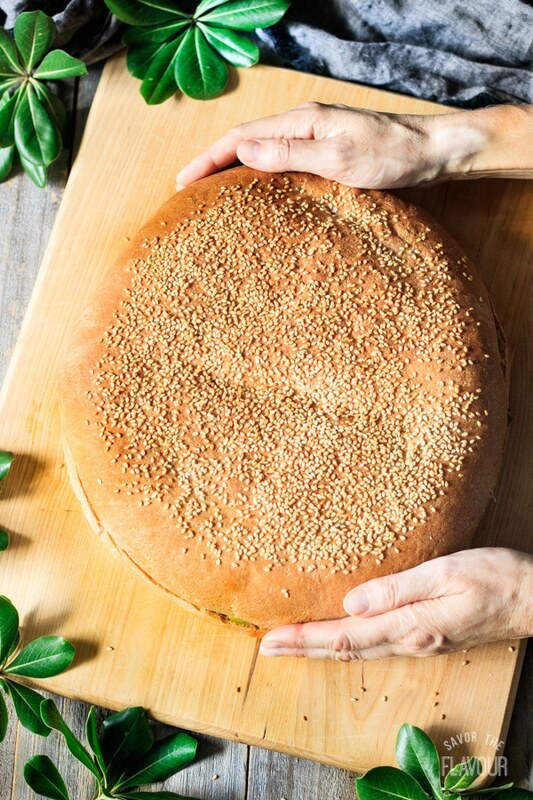 The good news is you don’t have to visit New Orleans to get a bite of this delicious muffaletta. Follow these recipes, get your cheese and meat from your local deli, and you too can have a taste of N’awlins in your kitchen. Make an unforgettable muffaletta sandwich with these other recipes. 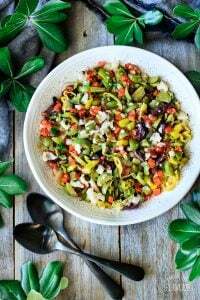 Olive Salad for Muffaletta: a colorful, Sicilian-inspired salad that’s the key component of a muffaletta sandwich. 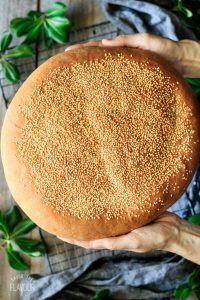 Perfect Muffaletta Bread: this soft, light-textured bread is the foundation of an authentic muffaletta. Share how you enjoyed this muffaletta sandwich by leaving a recipe review below. We’d love to hear your thoughts! 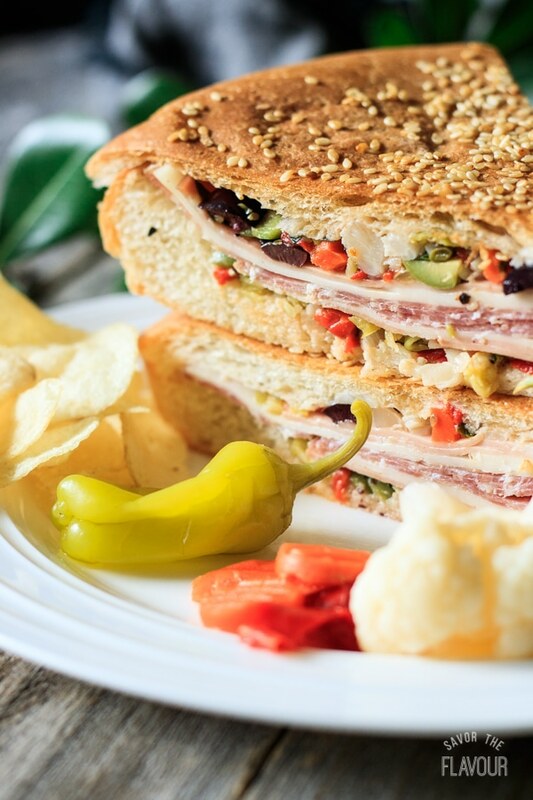 Muffaletta is an iconic sandwich from Central Grocery in the French Quarter of New Orleans. 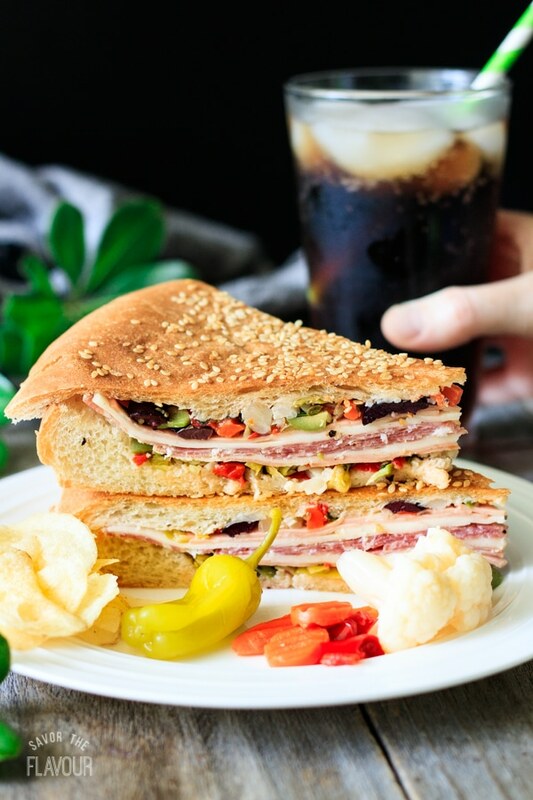 Fresh bread, olive salad, deli meat, and cheese are layered in this showstopping sandwich. It’s an unforgettable addition to your Mardi Gras or Super Bowl menu! Slice the muffaletta loaf in half horizontally with a long bread knife. Put the bottom half on a large cutting board, and put the top half on paper towel. 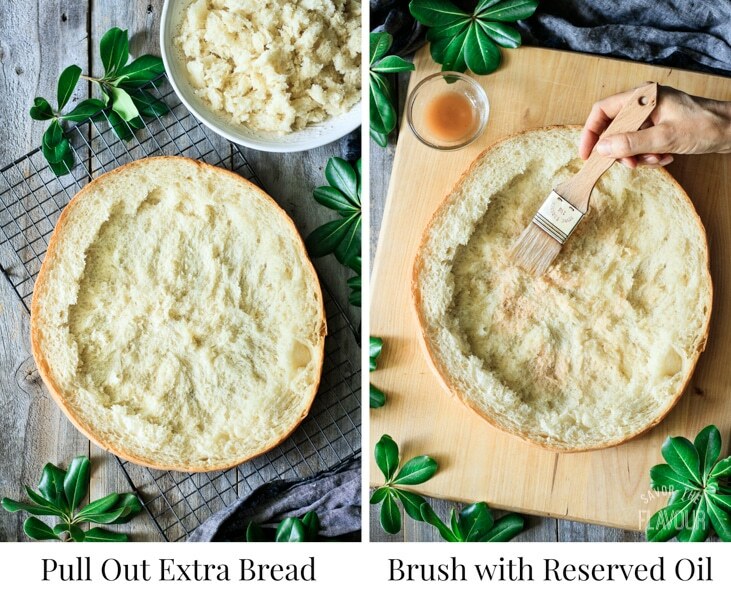 Tear out chunks of bread to make a hollow in each half, leaving a one inch rim. Be careful not to take out too much bread, or the bread will get soggy and flimsy. Put all the bread chunks in a bowl to snack on or in a freezer bag to use as croutons or bread crumbs. Brush the olive oil on both of the hollowed out halves with a pastry brush. Also brush on some of the oil from the olive salad to give it additional flavor. Put half of the olive salad in the hollowed out part of the bread on the bottom half. Repeat for the top half. On top of the olive salad, start with a layer of mortadella, then provolone, and then sopressata. Do the same to the other half of bread. Carefully flip the top half of the bread on top of the bottom half. Keep the paper towel on the bread while flipping it to make cleanup easier. 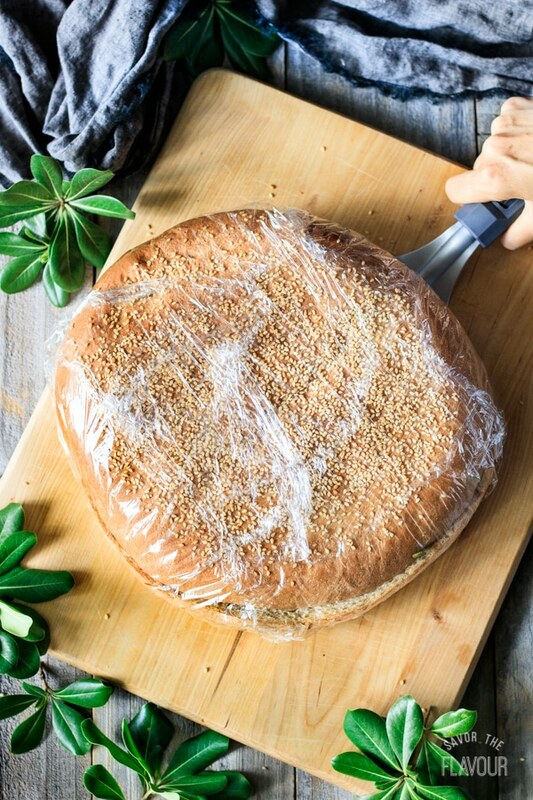 Tightly wrap the muffaletta in plastic wrap so it doesn’t dry out. Use a cake lifter to help. Keep the sandwich on the large cutting board for ease when moving it. 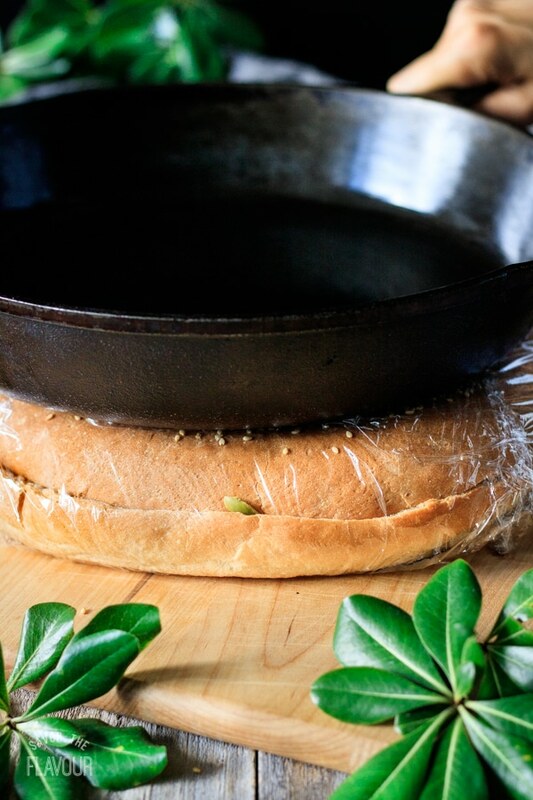 Place the cutting board and the sandwich in the fridge to keep it cool, then put a heavy cast iron skillet or dutch oven weighted down with tin cans on top of the muffaletta. This will compress the sandwich. Leave the sandwich weighed down in the fridge for a minimum of 2 hours or overnight. When you are ready to eat, unwrap the sandwich and cut it into 12 wedges, as you would cut a pie. To be authentic, cut it in quarters instead of in twelfths. Serve cold with plain potato chips, pepperoncini, giardiniera, dill pickles, and root beer. If you would like more meat and cheese, just double the amount, so you’ll have four layers instead of two. Want to change up the meat and cheese? Cappacolla (spicy deli ham) and mozzarella are also popular choices in a muffaletta. It’s definitely one of my favorite fancy sandwiches!